Despite being overseas fighting the war against terrorism – these athletes still find time to get in a good workout. 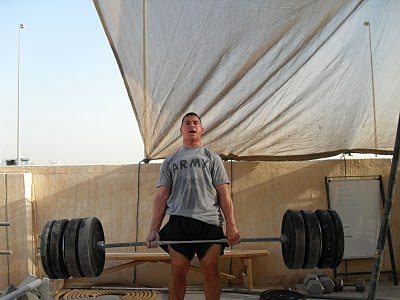 SGT Michael Snyder knocking out some deadlifts in their makeshift gym in Irag! 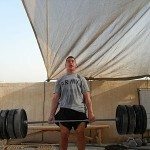 SGT Snyder is rocking a 375 lb deadlift for reps. That is what will get you burly strong! 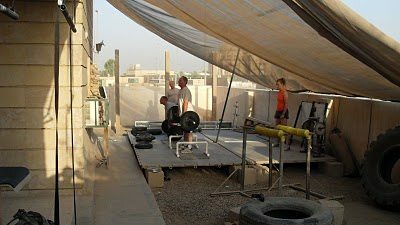 These guys and gals are not only serving our country overseas in a hot *ss hell hole — but still find the energy and motivation to jump up and crank out a tough CrossFit workout like “Diane” or “Randy”. Check out these CrossFit workouts to put the Rogue burner bar to the test. This killer gear has been battle tested by the Marines overseas in Afghanistan. 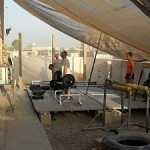 Check out this CrossFit workout dedicated to Marine Staff Sgt Daniel Hansen died February 14th in Farah Providence, Afghanistan when an IED he was working on detonated. Daniel is survived by his mother Sheryll, his father Delbert, his younger sister Katie, and his twin brother Matthew (also a Marine).